Dubai, February 19, 2018: Nikai Electronics, a part of the Nikai Group of companies, has concluded its search for best legacy recipes on its popular social media platforms recently. The campaign, which received an overwhelming response from various nationalities across the GCC, was held to draw in the best recipes passed down through generations. Nikai launched the campaign on the brands Facebook and Instagram. Three legacy recipes were selected as winning entries by the Nikai team and each of the winner received a Nikai Kitchen Hamper. 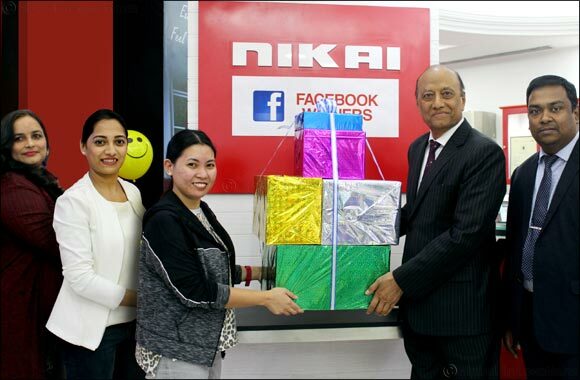 The winners declared at the end of the campaign were Jnalyn Oroonez, Heena Jillani, Jasmine A R. Each of them was gifted the Nikai Kitchen Hamper by Mr. Paras Shahdadpuri, Chairman of Nikai Group of Companies. “We also held a pre-valentine's campaign with a twist. Customers were asked to write love notes to their loved ones but by addressing the notes to their favourite appliances. It was a fun campaign that saw large participation and six couples won tickets to a popular comedy stand up show. Through the efforts on our social media platforms we hope to bridge any gap that there may be between our products and consumers. We will do a lot more through our social media platforms and create avenues and opportunities for Nikai users to win prizes, share experiences and thoughts,” Moorthy added. Nikai aims to steadily increase the online presence by regular customer engagements and initiatives that reach out to a larger audience.